Sonoma Community Center exists to enrich the lives of the people of Sonoma Valley by fostering a broad range of cultural, educational, and community services, and by the preservation of our historic building. Founded in 1953, the Sonoma Community Center has been meeting the cultural and recreational needs of Sonoma Valley for more than 50 years. Currently, the Center is a non-profit 501(c)3 organization that sponsors programs in drawing, painting, pottery and ceramics, theater, music and more. Scholarships are provided, with awards based on financial need. A free holiday dinner is provided on Thanksgiving, prepared by staff and volunteers. The Center also provides space and support for organizations that provide valuable programs, such as Alcoholics Anonymous and Red Cross Blood Drives. Since its inception, the Community Center has incubated many of the Valley’s non-profit organizations, providing them with the support they needed to become self-sustaining. The Center’s home, the old Sonoma Grammar School, was built in 1915 and has been designated as a National Historic Landmark. To learn more about the Sonoma Community Center and the wide variety of classes, activities and events, please visit Sonoma Community Center. 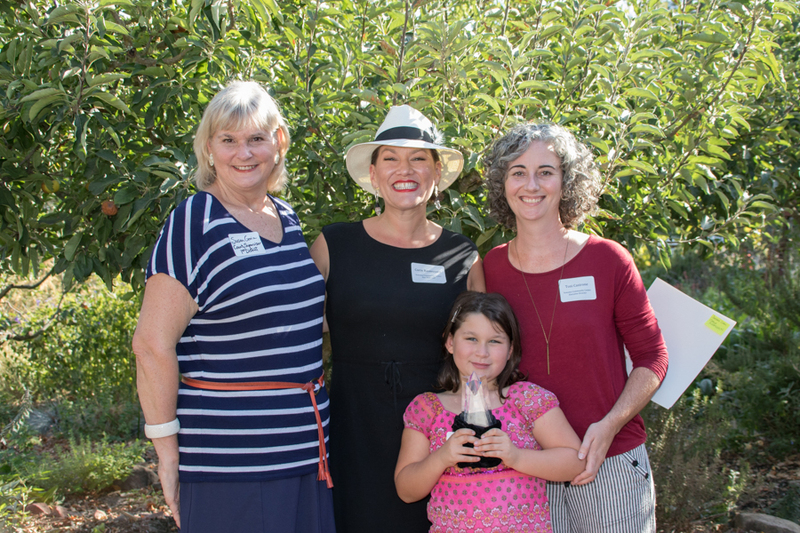 Sonoma Community Center's Executive Director Toni Castrone (right) along with Supervisor Susan Gorin (left) present the 2015 Star Award to Corin Rasmussen (and Corin's daughter Lulu). Corin is the coordinator of the annual Fourth of July parade. This beloved community event attracts more than 10,000 spectators and 100 parade entrants. Although she stepped into the role just two years ago, Corin is entirely adept at bringing order out of the chaos of parade entries and ensuring a safe and enjoyable experience for participants and spectators alike. Corin works hard, but manages to make it look easy, even while attending school for a nursing degree and raising her lovely daughter, Lulu.